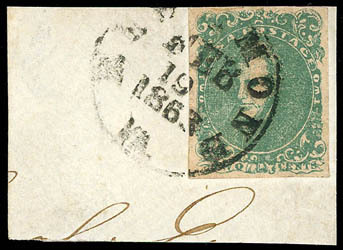 Confederacy, 1862, 2¢ green, major short transfer, Position 95L, large to huge margins including bottom sheet margin, bright color, o.g., never hinged, Extremely Fine and choice. C.S.A. Catalog No. 3-v4 $1,750. Scott No. 3 var. $1,000 + as o.g. 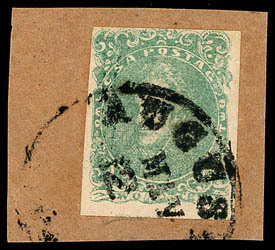 A RARE NEVER HINGED 2¢ GREEN LITHOGRAPH FROM POSITION 95L SHOWING THE MAJOR SHORT TRANSFER VARIETY AT BOTTOM. 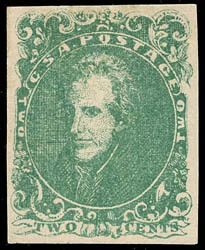 Confederacy, 1862, 2¢ green, four margins, bright color, o.g., Very Fine and choice; with 1985 P.F. certificate. 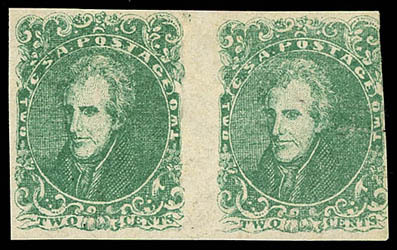 Confederacy, 1862, 2¢ green, horizontal gutter pair, left stamp with spur variety, positions L60 - R51, ample margins to just in at upper right, bright color, without gum, pressed out vertical crease and sealed tear, F.-V.F. appearance, a rare combination of a gutter pair and the plate variety, listed but unpriced in Scott, ex-Pegram; with 2006 C.S.A. certificate. C.S.A. Catalog No. 3-v6, 3, $4,750 as o.g. gutter. Scott No. 3 var. Estimate $500 - 750. Confederacy, 1862, 2¢ green, large margins, tied by clear "Richmond Va., Feb 19, 1863" cds on small piece, Very Fine and choice. Confederacy, 1862, 2¢ green, large margins, strong impression, neatly cancelled by Mobile Aug. 12th 1863 cds, Very Fine; with 1990 P.F. certificate. 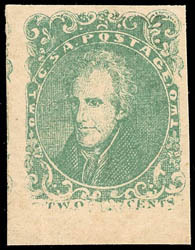 Confederacy, 1862, 2¢ green, three margins, tied by Augusta Ga. May 2 cds on small brown piece, F.-V.F., ex-Agre; with 1991 P.F. certificate. Confederacy, 1862, 2¢ green, two, separated unevenly and both with right sheet margin, bright shade, used with 5¢ blue (7), all tied by two strikes of blue "Columbia S.C. Oct 3" cds on light buff cover to Athens Ga.; barely reduced at left, both 2¢ lightly creased, left 2¢ with margin tear, fresh and Very Fine appearance. Scott No. 3 Estimate $3,000 - 4,000. 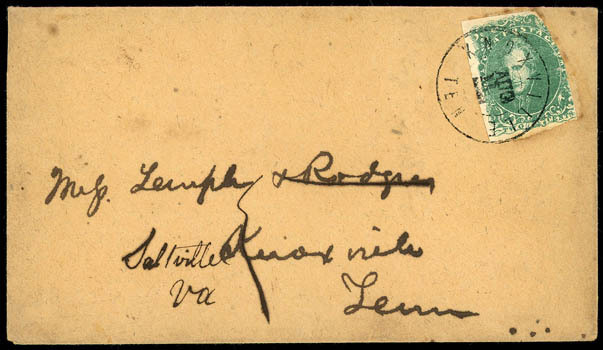 AN UNUSUAL COMBINATION COVER WITH THE 2¢ GREEN AND 5¢ BLUE. 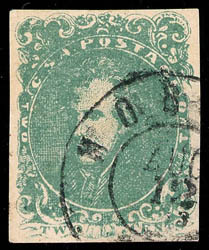 Confederacy, 1862, 2¢ green, right margin single, tied bold blue "Albany, Ga., Sep 16, 1862" cds on homemade cover to Capt. Wm. 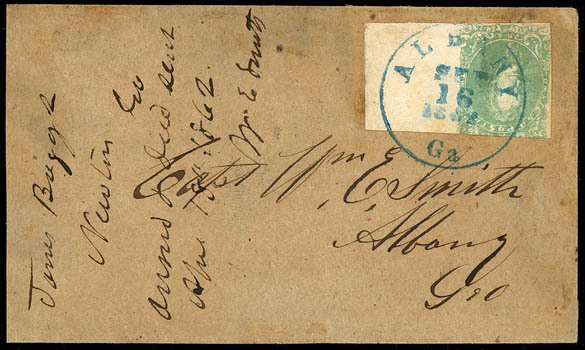 E. Smith in Albany, Geo., with docketing from James Briggs of Newton Ga.; cover slightly reduced at left., Very Fine, a nice drop use with a full sheet margin single. Scott No. 3 Estimate $1,000 - 1,500. 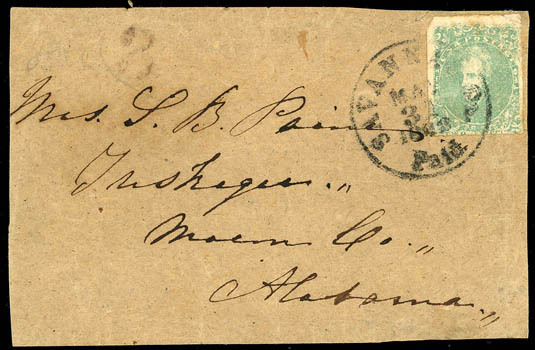 Confederacy, 1862, 2¢ green, tied by "Savannah, Ga., Paid, May 31, 1863" cds on wrapper to Mrs. S. B. Paine in Tuskegee Ala., light strike of numeral "3" handstamp at top left, stamp with minor gum soak in top margin, reduced at left, Very Fine; with 2006 C.S.A. certificate declining opinion on the origin of the "3" handstamp. Paine's son was Edward Hendree Paine, Lieut. Co. H. 61st Alabama Regt killed at Cedar Creek 10-19-64. 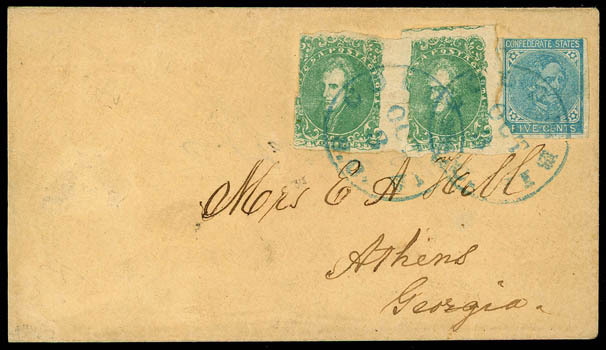 Confederacy, 1862, 2¢ green, rich color, margins large to in at right, tied by sharp "Knoxville, Ten., Aug 11" cds on drop rate cover, redirected to "Saltville, Va." with "& Rodgers" crossed out of address, Very Fine (Warren Census #TN-003) pictured in the 2011 Congress Book (page 51), ex-Boshwit, Cipolla and Felton. A conclusion given to the use is that it was a drop use where the postmaster mistakenly did not charge for forwarding. We believe that this may have been dropped and then forwarded to one of the principles of the company in Saltville outside the mails as there is no indication of re-entering the mails after delivery.